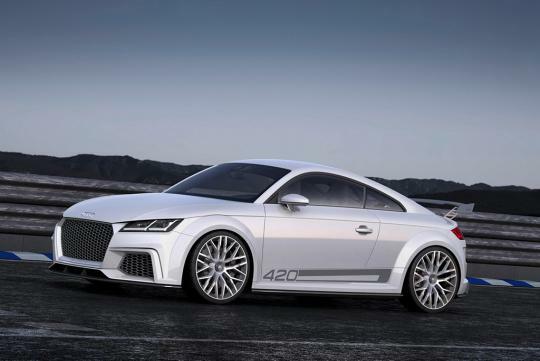 Audi has confirmed that it has stop development of its 420bhp, EA888 , four-cylinder engine that was first previewed in the TT Quattro Sport Concept back in 2014. According to Autoblog, Audi Quattro GmbH engineering boss Stephan Reil confirmed that “the 400bhp EA888 engine is dead.” It was designed by Freidrich Eichler who was also in charge of Mercedes-AMG's award-winning 2.0-litre turbo that powers the A45, CLA45 and GLA45. However, the Volkswagen Group decided to kill it as it was better for Audi to develop its existing five-cylinder which was thought to have more character than the four-cylinder. Also, the high output turboed four would have been more expensive to engineer than the five-pot.